If you follow wellness bloggers or Instagrammers, you’ve probably noticed that turmeric is having a major moment in history. A staple in Indian curries for centuries, this bright yellow spice is finally being promoted from being forgotten at the back of the spice rack to being included in every dish possible. This extremely potent antioxidant-rich and anti-inflammatory superfood banishes bloating and other digestive issues, helps prevent autoimmune diseases, and even helps boost skin health. From being added to a plethora of dishes to being incorporated into face masks, there’s really no shortage of ways to play around with turmeric. 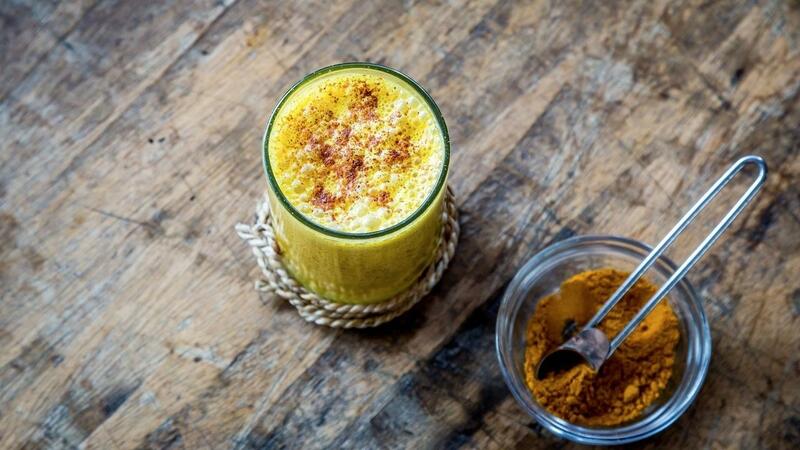 If you’re not new to turmeric, chances are you already have a golden milk recipe that’s rocking your mornings. Fortunately, we have 5 other incredibly awesome recipes that can be enjoyed anytime of the day and all year round. Preheat oven to 200°C. Prepare the cauliflower by removing the leaves and stem, keeping the core intact. Cut the cauliflower from top to its base into three ¾ inch thick slices, or “steaks” and season each side. Add 1 tbsp of olive oil in a large pan over medium/high heat and sear the cauliflower until it turns golden brown. Carefully transfer to a baking sheet. Whisk the remaining ingredients (except coriander) and brush over the steaks. Roast for 15 minutes or until tender, in the oven. Take the cauliflower steaks out and garnish with fresh coriander. Heat coconut oil in a pan and whisk eggs in a bowl in the meantime. Throw in chopped kale into the pan and cook until they wilt slightly. Pour in the eggs and add the turmeric, garlic powder, salt and pepper and optional chili flakes. Stir until eggs are cooked and serve with whole grain toast. Place all ingredients in a teapot or strainer and pour in boiling water. Steep for 10 minutes, pour into a cup and enjoy! Add all the ingredients to a blender and blend until smooth. Pour into glasses and enjoy with a large straw. Place all the ingredients into a food processor and blend until smooth. Taste to check if more seasoning is needed. Serve with wholegrain pita or sliced veggies.